With the right golf shoes, you can walk comfortably for hours. Wearing a comfortable pair of golf shoes when playing keeps your feet pain free, which allows you to focus on improving your game or just enjoying the experience of the sport. If the shoes are too large or too small, they will irritate your feet and quickly turn your round of golf into a painful ordeal. Before choosing the brand, color and style of your golf shoes, the first priority is to determine the proper size you need. Wear the same thickness of socks that you typically wear for a round of golf. Wearing socks that are too thick or too thin can give you an inaccurate reading when measuring your feet. Sit on a chair with your feet planted flat on the ground. Place your socked foot into a foot-measuring device, which are common at most stores that sells shoes. Push your left heel into the cup marked for the left heel until your heel is snug. Slide the width bar until it's gently touching the side of your foot and note the measurement reading at the tip of your big toe. The device is marked to tell you what size of shoe you need. Note whether the width bar indicates that you have thin, average or wide feet. Repeat the process with the other foot to ensure that your feet aren't slightly different in size. Keep these measurements in mind as you shop for a pair of golf shoes. 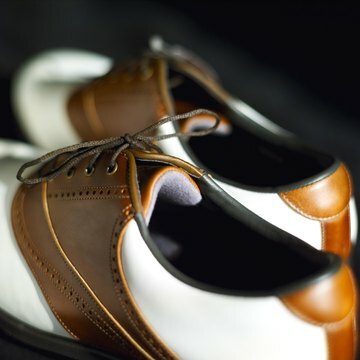 Golf shoes are available in virtually every size, and some manufacturers produce shoes for wide feet. Find several pairs in your size and try them on until you find the one with the best fit.